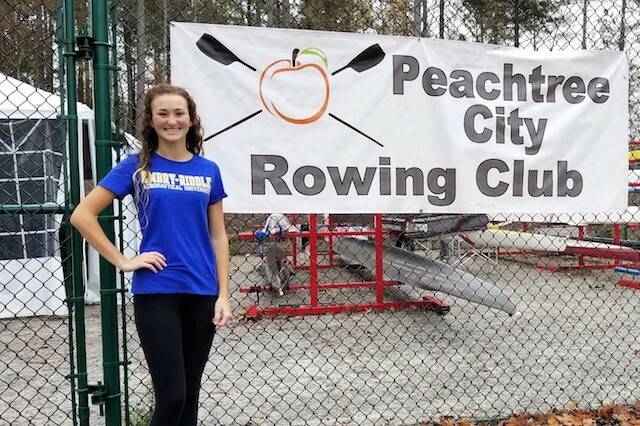 The Peachtree City Rowing Club has announced that one of its members has received a rowing scholarship and will attend Embry Riddle Aeronautical University in Daytona Beach, Fla.
Jodie Harmon, who began her rowing career last year at one of the club’s inaugural Learn-to-Row summer camps, has excelled in both land and on-the-water training and has proven to be an invaluable member of the club’s Junior Crew, according to a club spokesperson. Jodie signed her National Letter of Intent in early November and plans to study international business at Embry Riddle. In addition to rowing, Jodie maintains a 4.07 GPA and is on the Academic Honor Roll at McIntosh High School where she is a member of the Multicultural Club, Key Club, National Spanish Honor Society and BETA Club. She has also been a member of the varsity tennis team and the junior varsity volleyball team. She is the daughter of Steve and Janice Harmon of Peachtree City. Her younger brother and sister, Matthew and Kellie, are also members of the varsity crew. Additional information about the club and its winter programs can be found at www.ptcrowing.org.